Good. 0395726182 ALL BOOKS SHIPPED WITHIN 1 DAY OF PURCHASE! Very Good. 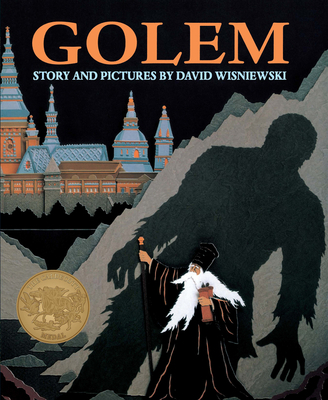 Golem (CALDECOTT MEDAL BOOK) by Wisniewski, David, 1996-10-18. Picture book. Sewn binding. Cloth over boards. 32 p. Contains: Illustrations. Intended for a juvenile audience. Fair in fair dust jacket. This is a used book. It may contain highlighting/underlining and/or the book may show heavier signs of wear. It may also be ex-library or without dustjacket. Good. Cover and/or pages are damaged. This is a former library or rental copy. It is stamped and stickered. This picture book is somewhat unusual. The text is very dark. This book is geared more towards a history lesson and I don't really think is age appropriate. This would be better for older kids, but older kids are not going to want to read a picture book. The vocabulary level is also very high for a young reader. This book is geared more towards the Jewish religion, so would be ok to teach if the lesson is religions around the world. It depicts the Jewish religion well. This book does have a really well written story line, which I feel is difficult to find in books classified as "picture books." I do not think I would use this to teach a lesson in school, I feel that this just depends on the students in the class.